Do you know the two diptyque collections which travel to the heart of the scents, fully exploring every aspect of their nature? Well, the first, “Les Hespéridés” (citrus scents), focused on citrus scents, the second, “Les Florales” (floral scents), breathes life into the iconic flowers of perfumery. Eau Rose paid tribute to the “Queen of flowers”, Eau Mohéli revealed the surprising truth of ylang-ylang. And now the new opus, Eau de Lavande, examines the subtlety of lavender, a small flower that turns the fields of the South of France bright blue. Designed like an eau de toilette, that can be used liberally on yourself or to share, these compositions have many sides to them, just like the purest of fragrances. The raw materials are rigorously selected, and the blend is sophisticated: the emotion remains intact, it is the fragrance we recognise from nature. It has a complex, generous nature. Wise and friendly, it evokes intimate memories: the scent of blue fields warmed by the sun, the soothing fragrance of cupboards filled with white linen. This elegant flower captures the essence of an English gentleman. 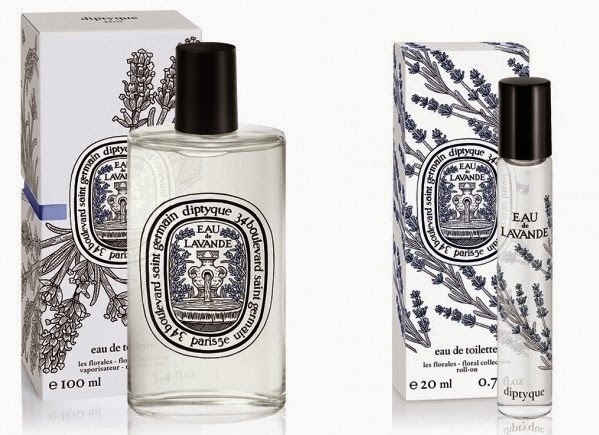 One of diptyque’s founders was British, and all three shared a taste for British-inspired style, one of the features that forged the diptyque identity. Eau de Lavande pays homage to this great perfumery classic, magnifying the beauty of its rare scent, which is often unjustly traduced by hasty interpretations. It re-asserts its qualities and allows us to re-experience those precious moments when nature imposed itself on our senses. However, lavender does not give way so easily, and while the essence is delicious, it does not truly reveal the natural scent. Although it is a flower, when it is dried by the sun, it has a distinctive aroma which is more sombre and woody. We have therefore blended three different French lavenders. Provencal lavender essence, rarely used as it is so precious, forms the base note, sustained by a few drops of incense and sandalwood, followed by a more floral essence from the Vaucluse, and more aromatic hybrid lavender from Valansole. Coriander seeds, nutmeg and cinnamon add spice to the composition, a vibrant incarnation of sublime nature. The fragrance is warm and subtle, alive and delicate...To complete the portrait, the bottle and packaging bring out the majesty of the flower, giving it the freedom to fill the space. The box is decorated with tightly bunched lavender, and bordered in the same color, while the iconic oval expresses the freshness of a fountain: Provence in a few strokes. The roll-on – whose small size makes it an ideal everyday companion – is illustrated with scattered, colorful sprigs which unfurl and look up to the sky with joyful energy... “The scent of lavender reached up to the stars...” (Arthur Rimbaud). Availability: Diptyque is available in Diptyque counter Fashion Avenue Pavilion KL, Kensapothecary Bangsar Village II, Isetan KLCC, Kensapothecary Bandar Utama & KENS BSC.